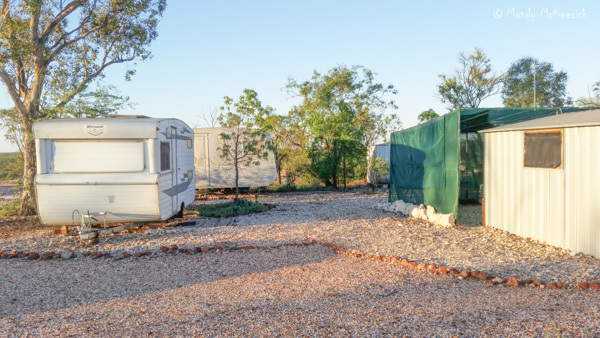 Yep, all those trips to the wilds around Lightning Ridge, all those stories I wrote – well it all got under our skin ….. and then in January there came an opportunity to buy a camp and a couple of claims ….. and then, well, we had a few wines with Col …. did a couple of courses …. and well, now we are going to be opal miners at the Ridge. 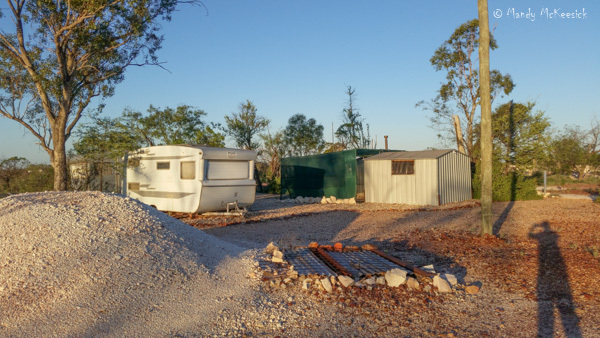 Two dodgy caravans, three garden sheds and (most importantly) an 8m long drop; all on a 50 x 50m parcel of land on the stark white opal fields. 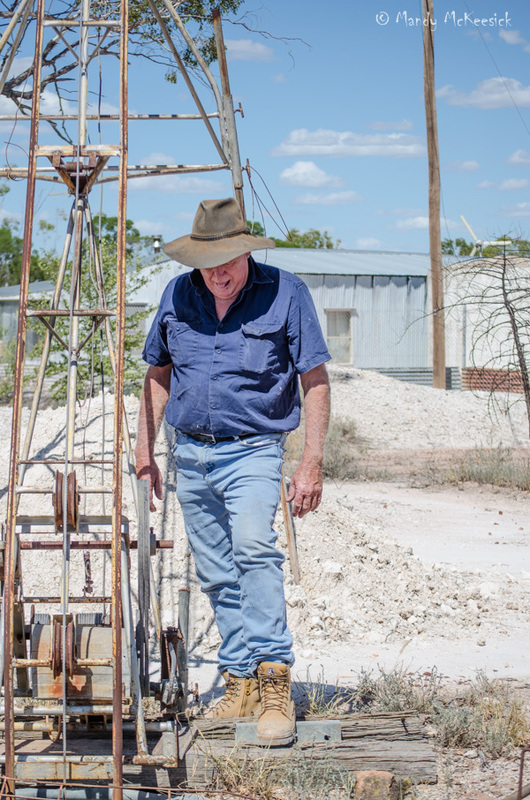 Our camp also includes three open opal shafts dropping 20m underground to a worked out opal ballroom. I think, when you come to visit, I may have to retain you in an electric fence between the long drop, the kitchen shed and your swag – to save you from meeting your fate at the bottom of a mine shaft. Actually the shafts (as you can see when I step back and re-shoot the above photo) are covered with steel mesh, which I am sure makes you feel a whole lot safer. 200m from the camp (on the Yellow Car Door Route for those of you familiar with Ridge idiosyncrasies) is our working mine. In March we did a couple of safety courses and had high hopes of descending into our mine – but the ladders had rusted through and fallen to the bottom of the hole. Here Col contemplates a 20m drop without a ladder. Of course we have dreams of fat black opals – and nightmares about collapsing mines. We worry about being fit enough to climb four stories of vertical ladders into the mine (and preferably back out again). We look forward to a few cold beers around a campfire watching the sunset, and then a soak in a hot artesian pool. We’re not sure who is going to be on the jack-hammer, who is going to be on the rickshaw and who is going to be on the surface supervising the winch. We really don’t know what we’re looking for though flashes of red/green/orange on a black background would be just fine – and if that’s also an opalised dinosaur bone – well, even better. We’ve got no gear and no idea but we like to keep life interesting. You can keep your snow skiing in Aspen and your tropical island paradise – Col, Brian and I are going opal mining! This entry was posted in Far Horizons and tagged Black opals, Lightning Ridge, opal mining, Yellow Car Door Tour. Bookmark the permalink. That confined space could have us all shivering. Not sure what to expect yet. Looking forward to the upcoming opal adventures, Mandy! They are such beautiful gemstones, and your adventures, no matter what, always make good reading. Thanks for the lovely words Lavinia. That’s great, can’t wait to see what the digging yields, and lets hope if you have to dig under the holiday house, it can just move to the left. There are plenty of old workings directly under the holiday house. My hope is that is does not cave in! Can’t wait to read about all of your opal mining adventures!